The Webfont is protected by copyright law. The Foundry is the sole, exclusive owner of all intellectual property rights, including rights under copyright and trademark law. Licensee agrees not to use the Webfont in any manner that infringes the intellectual property rights of the Foundry or violates the terms of this EULA. Licensee will be held legally responsible, and indemnifies Fontspring, for any infringements on the foundry’s rights caused by failure to abide by the terms of this EULA. 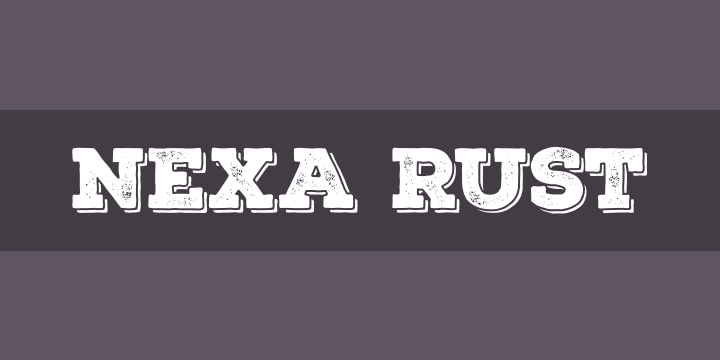 Nexa Rust from Fontfabric Type Foundry is a multifaceted font system consisting of font sub-families Sans, Slab, Script, Handmade and Extras.Each of these sub-families contains a number of font weights which have a characteristic warm, rough look and display a few degrees of saturation. Five (5) fonts from all 83 are available for direct download from Fontspring. Can be used in commercial as well as in personal projects!